We present a detailed study of Western Bohemia Love waves generated by blasts with an intention to estimate the uppermost crust structure for a more detailed layer distribution than previous studies have used. The use of short-period (4 s and shorter) Love waves represents a new approach in the studied region. Properties of multiple filtering as a tool of frequency–time analysis are discussed. A new method of selecting the dispersion ridges is introduced. Tests of filtering are provided by analyzing signals with analytically known dispersion. The isometric algorithm for the inversion problem is applied, the problem of non-uniqueness is discussed, and tests of reliability of the inversion are presented. During the inversion, the forward problem is solved by use of the matrix method. 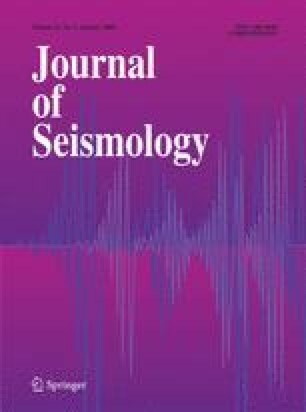 Six records of blasts from the Western Bohemia region are analyzed to separate the fundamental modes of Love wavegroups, and shear wave velocity distributions down to a depth of 3.0 km are inferred. Modal summation is used to compute synthetic velocigrams, which are compared to measured ones. The lateral heterogeneity of the region is discussed and the presented models are compared to those of previous studies and to the geological setting of the region.